The Mean Green only continue to get better with Seth Littrell and Mason Fine on campus. North Texas put together one of the best seasons in program history in 2018. Quarterback Mason Fine continued his ascent into the record books and Seth Littrell added to his impressive resume. But for all the positivity, there were missed opportunities. Three losses during the regular season came after blowing double-digit leads. The bowl game didn’t go how anyone hoped. 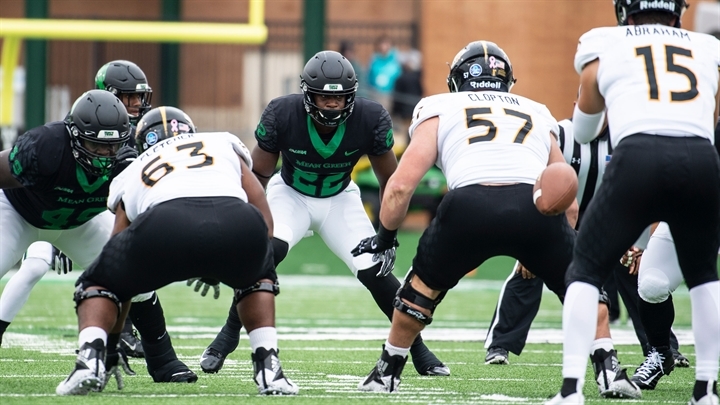 The good news is that North Texas has Littrell, Fine and a bulk of the roster coming back. Things are set up to be just as good next season. Here’s our full postmortem and review of the 2018 North Texas Mean Green football season. Fine only continues to add to his legend at North Texas. The all-time leading passer in history of the program threw for 3,793 yards and 27 touchdowns. He was criticized for accuracy early in his career – he responded by completing just under 65 percent of his passes. He was criticized for turning over the ball too much – he limited himself to just five interceptions. Fine is one of the best players to ever play at North Texas, and he still has a year left. Ejiya might be the most underrated defensive player in America. In a dominant senior season, Ejiya led the Mean Green with 121 tackles, an absurd 25 tackles for loss, nine sacks and 11 quarterback hurries. Littrell plucked Ejiya from the North Dakota State College of Sciences when he arrived in Denton. It’s safe to say his gamble paid off in a big way. UNT lost three regular season games during the season. All of them were in shocking fashion, and by a combined 13 points. The first time this phenomenon occurred was against Louisiana Tech. 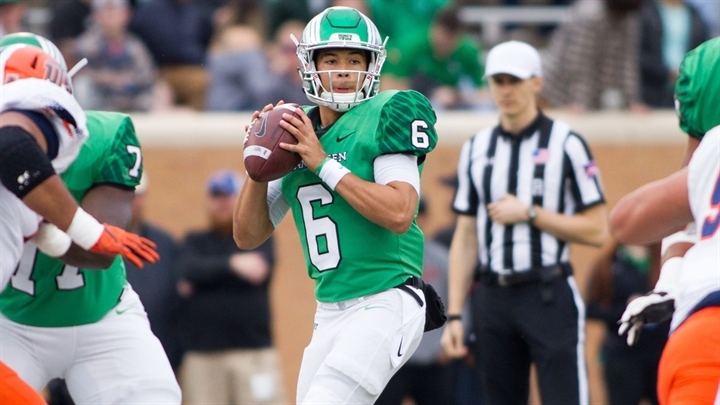 North Texas took a 21-6 lead at the half and seemed on the way to a dominant victory. However, Louisiana Tech scored 23 unanswered points to win. The same happened to UNT against C-USA champion UAB. The Mean Green took a 21-10 lead at the half, and gave up 19 unanswered points. The worst was easily against Old Dominion, when the Mean Green blew a 28-0 lead. North Texas had a very real chance to be 12-0 in 2018. In fact, the Mean Green were the only team in college football to never trail by more than one score throughout the regular season. They probably should have been 12-0. With an experienced quarterback and excellent coaching staff, the inability to finish was perplexing. There’s no moment as a Group of Five team quite like beating a Power Five opponent. Going on the road and demolishing one? Even better. North Texas was a double-digit underdog against Chad Morris’ Arkansas team, even after crushing SMU in the opening game of the year. Scoring an early touchdown was big. The infamous “fake punt return” was even bigger. Grad transfer kicker Cole Hedlund nailing a field goal to make it 17-0 was the kill shot. Hedlund was run out from Arkansas after struggling in 2017. When the dust settled, UNT beat Arkansas 44-17. Almost anything seemed possible. The Mean Green were the team to beat in Conference-USA. It was a huge win. North Texas got a tough matchup in Mountain West opponent Utah State. But still, nothing could have prepared Mean Green fans for what was about to happen in the bowl game. Fine got hurt early in the game, and the Aggies took advantage. Utah State scored 24 points in a decisive second quarter to turn what was once a close game into a blowout. Even worse, Fine went out for the game and did not return. Quinn Shanbour threw three interceptions in eight pass attempts to give us an early preview of the Cheez-It Bowl. Kason Martin did come into the game and throw a 75-yard touchdown, but it didn’t really mean all that much. The Mean Green were completely embarrassed, and at a game that was much closer to Denton than Logan, Utah. Biggest offseason question: Can Troy Reffett rebuild the defense? North Texas’ defense was highly underrated in 2018. Linebackers E.J. Ejiya and Brandon Garner were incredibly disruptive with 43 combined tackles for loss and 15.5 sacks. Cornerbacks Kemon Hall and Nate Brooks combined for a ridiculous 11 interceptions and 24 pass breakups. All four of those players are gone in 2019. Furthermore, UNT ranks No. 110 nationally in returning defensive production. Safeties Khairi Muhammad and Taylor Robinson are both back, which helps ease the load slightly. Top defensive lineman LaDarius Hamilton also returns to the team in 2019. But still, the Mean Green will have to replace a whole bunch of production with some young pieces. Reffett has changed the culture around defense at UNT in his short tenure. With so much coming back on offense, maintaining that level will be his most important charge yet. This team was 10 plays away from earning an A+. The Mean Green boasted one of the best teams in program history, and had the elite quarterback to match. But down the stretch, blowing big leads against Louisiana Tech, UAB and Old Dominion was discouraging. A bowl destruction at the hands of a Matt Wells-less Utah State left a bad taste in everyone’s mouth. But still, let’s keep everything in context. The Mean Green won nine games in back-to-back seasons for the first time since the 1970s. They beat every in-state program they played – including SMU. They beat an SEC opponent on the road too. This was a special year. Next season, UNT returns Fine, Rico Bussey, LaDarius Hamilton, Khairi Muhammad, Loren Easley, and a plethora of other playmakers. Littrell came back for a reason – he knows this team is poised for big things. With advances in facilities, North Texas isn’t going anywhere.